Any who – believe it or not, spring is right around the corner! It’s been in the 50’s all week in NYC, and 60 DEGREES on Sunday! What a day! And whenever I think of spring, I always think of: PESTO. The color, the freshness – I dunno, but it just is the food equivalent of this gorgeous time of year! SOO, I decided to create a dish the makes pesto the star of the show. Along with my other favorite food: BEETS! And this dish highlights them beautifully. What is it? 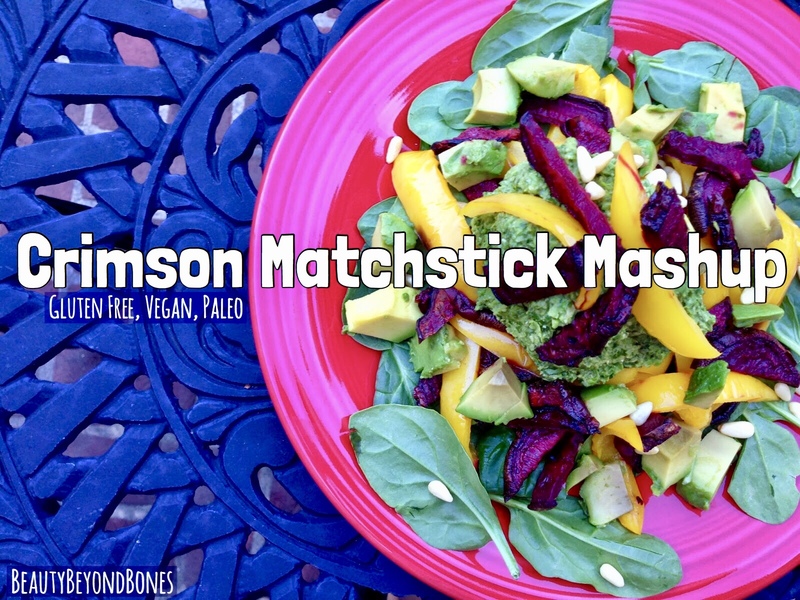 My Crimson Matchstick Mashup Salad! Roasted red pepper and beet matchsticks topped with a luxurious broccoli/avocado/pesto cream! Simply delicious! And it’s gluten free, vegan, Specific Carb Diet friendly, and Paleo! Preheat your oven to 400 degrees. On a tin foil-lined, olive oil-sprayed baking sheet, place the beet rounds and pepper thirds in a single layer. Spritz or toss with olive oil and bake for about 30-35 minutes, flipping once halfway through. Hit with salt and pepper when they come out of the oven. Meanwhile, steam the broccoli and peas, by either steaming in in a steamer basket, or nuking them in the microwave in 1/2 inch of water for about 3 minutes. Let cool, and then combine the steamed broccoli and peas with the rest of the pesto ingredients in your food processor. Process until smooth, scraping the sides several times. When the beets and peppers come out of the oven, let them cool slightly, and then cut into matchsticks – about 1/4 inch thick. Finally, dice your other avocado. To assemble, lay a bed of spinach on your plate. Top with the beet and pepper match sticks, and the diced avocado. Top that with your pesto cream. Garnish with fresh basil and toasted pine nuts. My goodness, how delicious was this dish?! There’s something truly magical about roasted beets. The sugars caramelize and become intensely sweet with a wonderfully earthy tone. And same with the peppers! There’s a smokey sweetness to them too. So that sweetness paired with the fresh basil and bright lemon was just delightful! And then the pesto cream! Good golly was this wonderful! The texture was creamy and rich from the avocado, yet surprisingly light and ethereal! It was the perfect texture compliment to the crunchy/chewy beets and crisp baby spinach. But oh boy – the avocado just took it over the top — so buttery and luxurious! Finally, it was a stunning dish. The bright green pesto against the deep purple beets made this dish just jump off the plate! What is YOUR FAVORITE springtime dish? MAGIC TOOTHPASTE? Yes! I am in love with this superior whitening toothpaste. It keeps my smile sparkling, without sensitivity or bleach! I made a website where you can directly order this miracle product! So if you want to give it a try, you can go ahead and grab a tube for yourself. I promise, your smile will thank you!Get a tube! Be sure to check out my affiliate, Audible. Listening to audiobooks while I cook is literally my new favorite thing. And just for you, they’re offering a Free 30-Day Trial Membership. And with this free membership, you’re going to get 2 free audiobooks! Literally. Free. It is the best deal ever. And if for some reason, you decide it’s not for you, you can cancel within those 30 days and it’s zero money out of your pocket, plus, you get to keep the 2 audiobooks. Soooo…it’s pretty much a no brainer. Plus, it’s a free and easy way to support this blog! So thank you!! Get Your Two Free Audiobooks! Previous Post I Ran the NYC Half Marathon – on 1 Hour of Sleep! Yum, can I say I just love beets in the oven. Avocado is something I still can not put in my mouth, lol. Might give this a try in the next week. so what would be a good sub for the green goddess veggie? Caralyn, this salad sounds delicious. My tasye buds are salivating just thinking about it. Beets in the oven are the best. Thanks for sharing this pesto recipe. My df girl isn’t strictly on the scd plan anymore, but she’s still careful–and dairy free. Pesto is something she misses when the rest of us have it. I’ll have to surprise her with this one! 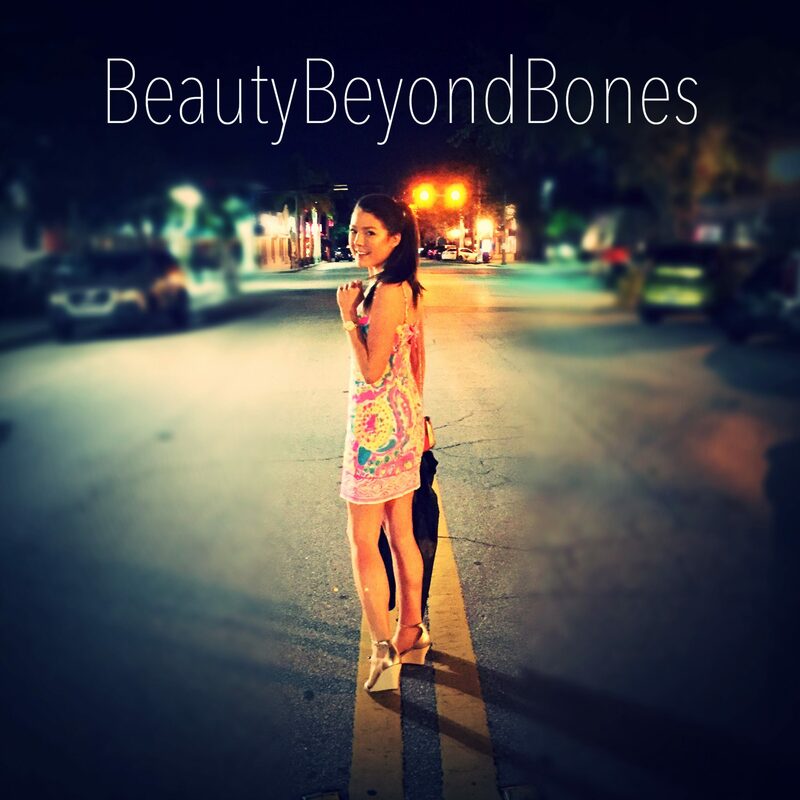 Just wanted to thank you for how you handle yourself on your blog, especially when confronted. There are times when some want to pick a fight, and you consistently respond with grace. What a great example you have been. I learned a thing or two from you when I was recently confronted by another Christian (not on my blog). Responding with love and grace was easy since I’ve seen you do it. So, thanks!